Rigorous Intuition: Why are "insiders" not to be trusted, until they tell us what we want to hear? David Shayler was one of the guests. I haven't listened to it all yet, so cannot make a judgment. If you have Real player you can fast forward - starts at about 30 mins into the show. Here is a Google clip to David Shaylor on UK Sky News on 5/12/06.
. . . thats another few million who might have been woken up. Little by little the media are starting to give the Truth Movement some airtime. I want to thank Shayler for hijacking the opinion segment that he was featured in, which was supposed to be largely about the assassination of Russian spy Alexander Litvinenko via polonium poisoning. British and US media have been in an awful hurry to blame Putin for the assassination, but frankly, anyone with the dough can get a toxic quantity of polonium together, quite legally. 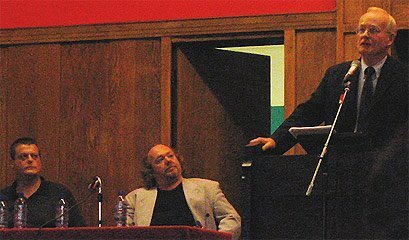 Shayler then quickly moves the ball upfield, referencing Litvinenko's assassination as an ironic example of False Flag activity which he uses as a pivot point to tie in 9/11, possibly 7/7, and other terrorist acts as further examples of manufactured terror. He deftly rattles off a host of 9/11 anomalies which would surely make someone hearing them for the first time at least raise an eyebrow, and maybe even type a few keywords into a web search engine. He is bold enough to pin 9/11 on the US establishment, rapidly humming through the PNAC foreshadowing from memory. In this recent debate on UK's Sky News, David Shayler gives a convincing explanations of false flag terrorism and the involvement of multiple intelligence angencies from various governments. He relates the bizarre Russian spy poison plot to 9/11and 7/7. And manages to cite PNAC, WTC7, Dancing Isrealis, Controlled Demolitions, Automated Pentagon missile defense system, 7/7 fake bombers, 7/7 cancelled Luton train, Mossadeq, NWO and more. Unfortunately, he does mention more contentions issues such as Pentagon hole and no-plane theories. Still, this is pretty amazing for a Murdoch-owned channel! What follows is uncut and unedited footage of the events at the Skipton 911 Truth Movement's first meeting in the town, held at the Narrowboat pub on the evening of Thursday 19th October 2006. The two speakers concerned were David Shayler (former MI5 officer) and his partner Annie Machon (also former MI5). The reason I filmed this event was to provide a document of proceedings thereby allowing those who were unable to attend to view the event online. The film was made with the permission of the organisers. Apologies for camera shake and poor sound in parts. * An introduction by David Shayler. * A talk given by Annie Machon. * A questions and answers session run by both David and Annie. Yesterday I had the privilege to attend the London event with David Ray Griffin and David Shayler: Was 9/11 an inside job ? The event got an excellent plug in yesterday's Guardian. A Christian theologian, David Ray Griffin is one of the most fluent, eloquent, impressive and persuasive people to write and talk on 9/11, and who's contributions to 9/11 study, critique and discourse have simply been enormous, so I was very much looking forward to this lecture. After the introductions by a leading UK 9/11 Truth activist; a fellow called Andy, Shayler gave an excellent and very down to Earth and very decent speech which covered himself, his background in MI5 and 9/11 which progressed into a particularly outstanding section about liberty and democracy in the UK which got a large round of applause. Griffin gave an excellent and detailed speech which covered a great deal of ground from the alleged hijackers, NORAD's response, the destruction of the WTC, the Pentagon and the political backdrop to 9/11. Check out the link above for 3 youtube videos and a handful of pictures from the event. Thanks to jultra for the heads up!